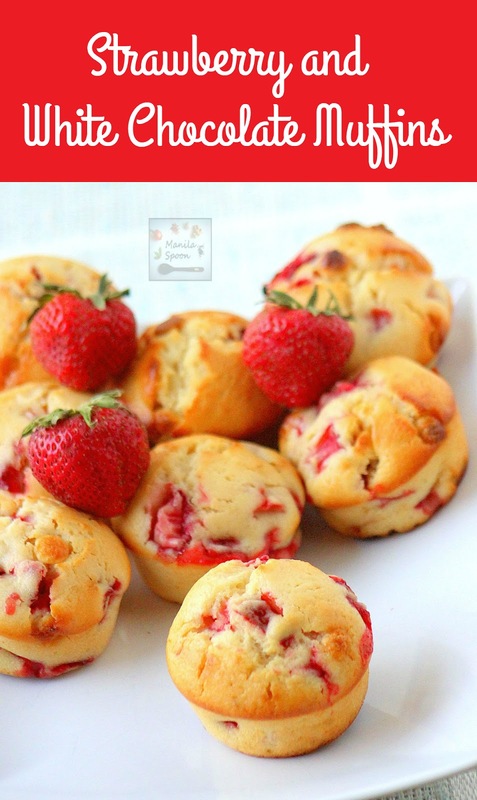 Moist, fruity and chocolaty fresh strawberry muffins are the best way to start your day! Imagine a cold and gloomy morning and you wake up to the delicious aroma of freshly baked muffins that’s still warm and waiting just for you! What an ideal way to start the day, right? It’s not impossible and I sure have an excellent recipe for you – Fresh Strawberry and White Chocolate Muffins! I am so happy that now that it’s spring we are getting more strawberries in the store and when they abound that means you can purchase them at a very low price. Since we bought quite a lot of strawberries I have been in a Strawberry baking frenzy! Just last week I made three strawberry cakes and yesterday I made these! There’s just something about fresh fruits and especially strawberries – they’re just so perfect for baking – not only do they impart that pretty reddish-pinkish hue to any bread, cake or muffin – they also lend it the yummiest and freshest flavor too! Each bite into these Strawberry muffins truly bring such pure delight! I thought I’ll have some for breakfast this morning but my kids love these so much, especially my little boy that when he came home from school yesterday – he ate the rest….I must confess I did have 3! Yikes…it’s that good! Preheat oven to 400F/200C. Line your muffin pan with paper cups. I use the Demarle Flexipan Muffin trays . In a large mixing bowl, mix all the dry ingredients together. Set aside. In another bowl whisk the eggs together until combined. Add the rest of the wet ingredients (yogurt, oil and vanilla) and mix together. you can also use a whisk. The batter would be thick. Fold in the berries and the chocolate chips. Divide evenly among the 12 muffin cups. I use a large ice cream scooper for this. So handy! A full scoop per cup is about right. There is enough batter (nearly full) for each cup, sufficient to give your muffin a nice dome. Bake for about 18-20 minutes or until a tester comes out clean. Remove from the oven and after about 5-8 minutes (when it’s cool enough to handle) transfer to a wire rack to cool completely. Enjoy! Thanks Jerry! Glad you like it. Appreciate you stopping by. You totally had me when you took the photo of the muffine with the view inside! *drool hehe I'm such a sucker for muffins! I usually do not make it as perfect as these though.. I had a thought though Ms. Abby! I hope you did some strawberry shortcake during your frenzy! I'd love to see one that you make. Its my favorite! G'day! LOVE your photos, TRUE! What a great combination, healthy and can't wait to try and make too! These look so fresh and inviting, Abby! I'm all about strawberries right now…can't get enough! I'd love one of these right now with an afternoon cup of coffee! Have a great weekend! Thanks, Carol! Love this with my favorite cuppa, too! Se ven muy suaves, húmedas y muy lindas también opino que es una gran receta,hugs. Oh wow, Sajina! That is so very kind of you. Thank you very much! This look delicious Abby! love the white chocolate and strawberries combo..
A great combination, indeed! Thanks! I have a bunch of strawberries that are looking a little sad, I am so making these today! I may add some wholewheat flour, don't tell the kids. You can choose the flour that you like, I will try next time to make this gluten-free! Thanks for stopping by. Thank you for sharing these at my facebook strawberry and dip party. Its been shared. Am sure it's fine….that's a wonderful idea. I should try that for next time! Thanks, Luisa! Thanks, Becca! 🙂 Glad you stopped by. Sorry I hardly use yogurt for my ingredients…. May I know whether is the yogurt plain (sour) or vanilla flavour…? Hi Tammy, you can use Vegetable Oil, which is probably a better sub because you don't need to wonder how much exactly you need as it will be the same measurement as Olive oil. Thanks! OHHH!!! YUM!!! I am going to make this!!! Especially because it is strawberry season now here in Holland!!! I live near a strawberry farm so their produce is really fresh and sweet!!!! Thanks for posting this one! I love this recipe, thanks for posting it. I do have a question though. I don't have any yogurt. Do you think I could substitute sour cream for the yogurt in this recipe? Most certainly Holli. I often exchange the two, depending on which one is available. Please enjoy. Can't wait to try this recipe looks so yummy right now. Thanks and please enjoy Erica! Can the yogourt be replaced by sour cream by chance? Wondering if we can replace yogourt with sour cream? Yes, certainly Angel! Please enjoy! Could this be made into a quick bread? I assume I would just bake it for about 45 minutes-1 hour? Sure, just adjust the baking time accordingly. Please let us know how it goes Heather. Thanks! I made this today as a quick break with regular chocolate chips. It was really good. If making as a quick bread, I would decrease the temp to 350 and bake for about 45 minutes. I kept the temp at 400 for 45 minutes and the bottoms are a little too dark. Nothing I can't cut off or eat around. The other thing is the strawberries…I think I should have cut them even smaller than I did. I will make this again. I made some for my mom and my new neighbor. Figure it's a good housewarming gift! I made these last night! I knew as soon as the batter came together they were going to be AMAZING just because the batter smelled SOOOO delicious. I altered the recipe to make it vegan – substituted Ener-G egg replacer for the eggs, unsweetened coconut milk yogurt for dairy yogurt, and non-dairy semi-sweet chocolate chips for the white chips. They are sweet, moist and delicious. My husband and I polished off three each right out of the oven. I will be making this constantly during berry season! Thanks for posting! That is so amazing to know! Appreciate you stopping by to let us know! Enjoy! Can you make these with frozen strawberries? We don’t have fresh strawberries here in Illinois. Just adjust the baking time because frozen strawberries have extra moisture and you don’t want to end up with a soggy mess. I live in CT but I still find some fresh strawberries so if that’s available in your grocery, fresh is better. Thanks for asking.